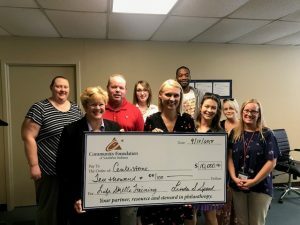 Centerstone was recently awarded two grants to fund treatment for Indiana youth. These grants from the PNC Foundation and the Community Foundation of Southern Indiana and will help expand services in Bartholomew, Jackson, Jennings, and Clark counties. The PNC Foundation provided $5,000 in support of Say It Straight, an evidence-based prevention program designed to increase empowering communication skills and reduce risky behaviors such as substance abuse. Say It Straight has been used effectively with school-aged youth ranging from 2nd to 12th grade and has demonstrated long-term impact, with positive after-effects recorded 2 years post-intervention. Sessions are led by a trained facilitator, but each is co-created by the participants to ensure relevance and investment in the lessons. Over the last few years, Centerstone has been working with students in two nearby counties to deliver Say It Straight trainings. This grant will allow us to train additional staff facilitators in the Say It Straight program, launch new programs in Bartholomew, Jackson, and Jennings County schools, and establish an evaluation protocol to ensure fidelity to the Say It Straight model. 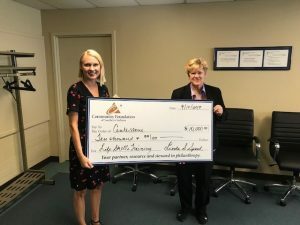 Centerstone’s Clark County Child and Family Services team recently hosted Community Foundation of Southern Indiana board member Sharon Handy, who presented the team with a $10,000 check for life skills training for children and youth whose families would otherwise be unable to afford this form of treatment. Life skills training is a proven, effective, interactive approach to building social, emotional, and behavioral skills that, in conjunction with therapy, can be used to treat a variety and mental illnesses and symptoms, from ADHD and anger issues to anxiety, depression, and trauma. Despite this, many health insurance providers in the U.S. do not recognize life skills training as a treatment option for individuals seeking mental healthcare services, and as such do not reimburse providers for this service. 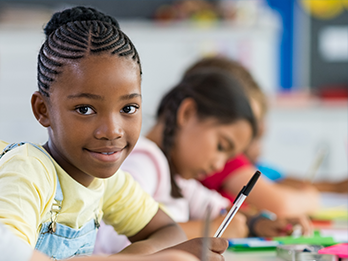 With the support of the Community Foundation of Southern Indiana, Centerstone can offer this beneficial service to Clark County children and youth who need it, regardless of their health insurance coverage. On behalf of our staff and clients, many thanks to PNC Foundation and Community Foundation of Southern Indiana for helping Centerstone provide life-changing care to Indiana children and youth! Accepting the check are (left photo) Sharon Handy, Community Foundation or Southern Indiana board member; Kati Guernsey, Clark County Manager of Child and Family Services; and Clark County Family Support Specialists and (right photo) Kati Guernsey, Clark County Manager of Child and Family Services and Sharon Handy, Community Foundation of Southern Indiana board member.